It was a gift to a client and they love it. This Down Perfect Pillow Top Feather Bed has a comfortable 255 thread count to prevent down and feather from escaping. Material made of 100-percent cotton allows the down to breathe, the small white goose feather bottom core provides firm and resilient support you need, and the white down pillow top provides the softness and luxury you want. This feather bed is also conveniently hypo allergenic, as a result of being cleaned with an anti-microbial process used to eliminate bacteria. With proper use and care this product may last a lifetime. We bought this featherbed to go on top of our tempurpedic mattress. The mattress was great for our backs, but made us way too hot all night. The featherbed fixed that by letting more air circulate and being breathable instead of latex. We fluff it every few days and that helps it keep its loft. It also has a cover on it to protect it from spills. We have had no feathers poking us or floating around the room at all, which is a negative I had heard about other feather beds. We just couldn't be happier with this one. Have had this featherbed about a year. I dont fluff it enough, maybe once to twice a month, but it is keeping up beautifully. I have been near bed-ridden these last 9 months, so it definitely gets more use than it would typically. Again, it is very comfortable! I am not poked by feathers or down. And the baffles are keeping in tact. They tried to add a “useful” feature of stiff elastic corner grips, but really, these are not worth the effort. I give them credit for trying! Does not hurt the performance of the featherbed. I did wish i knew a way to keep it from migrating however under the mattress protector (this is a great way to keep it clean by the way, and does not flatten out the feathers/down very much). I would recommend this product for anyone who wants firmer/supportive feathers, but to still feel like they are sleeping in a cloud. I've always wanted a featherbed and finally took the plunge! I love it! Well constructed and nicely filled - I'm sleeping better and wake up with less aches and pains! I use it on top of the mattress and fitted sheet as is typical in Europe - I did buy a washable cotton zippered case to protect it. I couldn't not be more pleased! PS: A featherbed is akin to the top on a pillow top mattress - it provides pillow top comfort and avoids the need to spend big bucks on deep pocketed fitted sheets! That's a win win in my opinion. Nice quality but compressed too easily for me. Made my back and neck ache. I chose an all duck feather bed by Hilton to Home. It is very supportive. Cushions without flattening. This down pillow top is very comfortable, none of the feathers Stick me like an old one i used to have. It fluffs back up when I shake it outl. The pockets are pretty deep to wrap around my 14” mattress. Opened up and the topper felt damp, has a very over powering smell too it. Honestly smells like every feather that was plucked came from the goose’s *** On top of that not as comfortable as I thought. Overall disappointed with this purchase. We love this featherbed. We have a comfortable and restful nights sleep. This was a great purchase. Thank you for a top notch product. Best featherbed I have found. Fall asleep faster and wake up with no back pain. Airs out quickly and no feather smell lingering. Good quality. Highly recommend. I would like to give this a higher review. It is so soft and comfortable. Feels like I am laying on a pillow. The negative - cannot keep this in place on our California King bed. The elastic straps that are supposed to hold it in place a constantly sliding off. This means the entire featherbed is moved. Perfect topper For a harder than expected temperpedic mattress. It rolls off the mattress and mats otherwise a wonderful addition. I bought this as a gift for my daughter and she is absolutely thrilled with it. She says not only is it soft but it helps to keep her warm too. She is delighted with it! Don't waste your money on this. Very uncomfortable pillow top. Felt mostly like feathers...not fluffy at all. If your mattress is really, really hard I can see this being an improvement, but otherwise it will totally ruin the softness of most mattresses. I returned it. "What size is this Mattress topper "
This topper is currently available in a twin, full, queen and king size. Please use the options menu to make your selection. You can find their exact sizes listed in the product description. "What is the fill power of the top down portion? Thank you!" 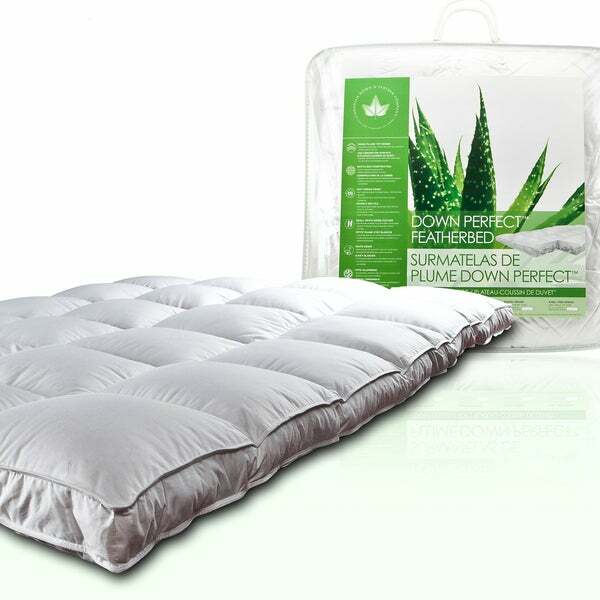 I chose this product because of the reviews and because it is a down feather pillow top featherbed. 550+ fill power and a 5 year manufacturer warranty. ALL the others we've purchased, even recently, are junk within 4 months.